Splash some colours and make a vibrant choice. Cheer up the day of your loved one with a gorgeous combination of 12 colourful carnations in a vase. Create memories to be cheerished forever.Note: The flowers may slightly differ based on the availability. Splash some colours and make a vibrant choice. Cheer up the day of your loved one with a gorgeous combination of 15 colourful carnations in a vase. Create memories to be cheerished forever.Note: The flowers may slightly differ based on the availability. Splash some colours and make a vibrant choice. Cheer up the day of your loved one with a gorgeous combination of 20 colourful carnations in a vase. Create memories to be cheerished forever.Note: The flowers may slightly differ based on the availability. Splash some colours and make a vibrant choice. 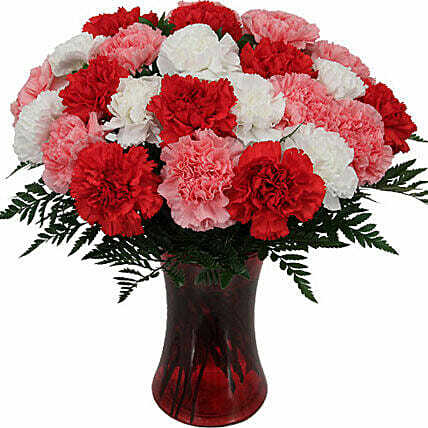 Cheer up the day of your loved one with a gorgeous combination of 20 colourful carnations in a vase. Create memories to be cheerished forever.Note: The flowers may slightly differ based on the availability. "Had a great experience. Will be a repeat customer for sure."